Alsace — French Tier IX battleship. ​Continuing the grand tradition of the French battleships from Normandie at Tier VI onward, Alsace brings twelve 15-inch rifles in three quadruple turrets to the table. Historically designed to counter the German H-class battleship projects, Alsace is the next step up from Richelieu, carrying a third turret to her rear, with her guns laid out in the AB-X style common to her peers of Lion, Iowa, Missouri, and Musashi. She has more guns than any other battleship of her tier, the second highest base top speed, plentiful secondaries, a potent AA suite, and excellent agility. Alsace is well-suited for both mid-range dueling and close-range brawling, utilizing her mobility to move into prime positions, and to escape if the situation turns against her. With Speed Boost active and the Sierra Mike signal flags equipped, Alsace can easily chase or outrun enemy battleships, even able to keep pace with cruisers in a straight line. However, Alsace doesn't have everything going for her. She has the smallest guns at Tier IX at 15", leading to her lower overmatch statistic, meaning she can't overmatch bow armor thicker than 25mm. While her armor is decent, she has the second lowest health pool of all tier nine battleships; the lowest goes to British Lion, but while Lion has a super-charged version of the Repair Party ( ) consumable, Alsace does not. Alsace relies on her high mobility and properly angling her armor (made easier by her excellent turret arcs) to survive against her peers at Tier IX. Alsace comes fully equipped for aggressive and mobile game play, where cruisers are easy prey and battleships have no hopes of keeping up with the agile and swift Alsace. ​Excellent top speed of 32 knots, second to Iowa & Missouri’s 33 knots. ​Carries the highest number of main guns at her tier, with twelve 15-inch guns in three quadruple turrets. ​Good AP and HE shell velocities, both at 830 m/s. ​Excellent secondary range of 7.5km base, able to reach 11.3km with the correct build. Excellent AA suite on Hull (B). Has the ability to use Speed Boost, pushing her top speed to 34.6 knots; with the Sierra Mike ( ) signal flag this takes her up to 36.3 knots. Poor surface & air concealment. Lowest main gun range of her tier, tied with Friedrich der Große. Large turning circle of 910 meters. Long main battery reload of 32 seconds. Smallest main gun caliber of 380mm at Tier IX, meaning Alsace can't overmatch the bow armor of cruisers like Ibuki, Buffalo and Roon. Most of the secondaries are 100mm guns, and can only reliably damage destroyers or superstructures on larger ships. Mediocre dispersion and an abysmal sigma of 1.6 partly counteracts the advantage of the high gun count. Second-lowest health pool of Tier IX battleships at 74,700, lowest effective health pool due to lack of the Lion's enhanced heal. Having all 32mm outer plating, very vulnerable to 203mm HE or IFHE 152mm guns, as well as Yamato and Musashi that can overmatch 32mm plating. Hull: Upgrade to Hull (B) for improved rate of fire on her 100mm secondary batteries, additional health, a modest increase in anti-aircraft firepower, and improved rudder traverse speed. Research of this module unlocks progression to République. Gun Fire Control System: Upgrade to PCA n° 9 Mle 2 for an extra 10% range on the main battery. Propulsion: Upgrading the engines provides an additional 1.6 knots of maximum speed. Reaching the Fire Control System first is the top priority, as Alsace’s stock range sits at 18.4km, lower than all her peers. Her stock hull anti-aircraft suite is surprisingly capable, and the only major downside of Hull (A) is the base 23.2 second rudder shift time; this leaves captains with a choice between Hull (B) — to greatly reduce her rudder shift and improve her survivability and AA — or her Fire Control System to boost her range as their first upgrade. Finally, her Engine upgrade can be saved for last, as her base top speed of 30.4 knots already makes her the second fastest Tier IX battleship. As a Tier IX ship, Alsace has access to all six Upgrade Slots. Alsace can build for Secondaries or AA. Slot 1: Main Armaments Modification 1 ( ) to improve her main battery survival, or Auxiliary Armaments Modification 1 ( ) to improve her secondaries and AA. Slot 2: Damage Control System Modification 1 ( ) To improve her overall survivability in game; this also further increases the already stellar level of Torpedo Protection she has. Slot 3: Aiming Systems Modification 1 ( ) to improve her main battery accuracy, AA Guns Modification 1 ( ) for an AA build, or Secondary Battery Modification 2 ( ) for a secondary build. Slot 5: Concealment System Modification 1 ( ) to reduce her detection range. Target Acquisition System Modification 1 ( ) is also a viable choice if torpedoes are a recurring threat. Slot 6: Main Battery Modification 3 ( ) is the best option for this slot. The -20% loading time for secondary armament offered by Secondary Battery Modification 3 ( ) is of little overall benefit, and AA Guns Modification 2 ( ) is only recommended if you are division-ing with a friendly aircraft carrier to guarantee seeing an enemy carrier in return. 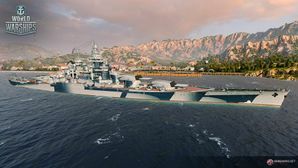 As an agile but fragile Tier IX battleship, Alsace benefits from almost any improvement to her survival department, but her secondaries and AA batteries are perfect for improving. General-purpose skills that benefit any Alsace captain include Preventive Maintenance, Expert Marksman, Adrenaline Rush, Superintendent, Concealment Expert, and Fire Prevention. Alsace hugely benefits from the premium consumables Damage Control Party II ( ), Repair Party II ( ), and Engine Boost II ( ). Players who wish to spend doubloons can equip Alsace with Type 19 camouflage that lowers her detection radius, reduces the accuracy of incoming shells, reduces her repair costs, and increases the amount of experience she earns. As a Tier IX Battleship, Alsace benefits greatly from signals that improve her survivability, such as November Foxtrot ( ), India Delta ( ), and India Yankee ( ). Signals that increase experience and credit earnings can also be useful, as well as those that boost her secondary battery and anti-aircraft armament. Alsace launches a catapult fighter to help screen for torpedoes. Line drawing of French battleship design study "Type No. 3". During late 1939, studies were being drawn up for capital ships displacing 40,000 tons or greater to counter the German H-class battleships. Three studies were drawn up of a 40,000 ton, 42,500 ton and 45,000 ton battleships, alongside studies of 400mm, 406mm, and 420mm naval guns. To undertake the construction of a new generation of battleships even greater than the Richelieu class, would have required a major program to develop and expand pre-existing dockyards to be able to accommodate a ship of such a size. Early plans envisaged a dock 275 meters long and 58 meters wide, to be capable of accommodating the new generation of battleships that came to be the Alsace class, whose first form was slated to be 252 meters long and 35 meters wide. Of the three designs, the main focal point was the main armament. Type No. 1, the 40,000 ton design, was an up-caling of the Project C3 design that came out of the studies for the latter two Richelieu-class battleships Gascogne and Clemenceau. Type No. 1 was to carry nine 380mm guns in three triple turrets, laid out in the contemporary AB-X style, with a secondary armament of nine 152mm guns in three triple turrets, and sixteen 100mm dual-purpose guns in eight dual turrets. It was designed to be capable of a top speed of 31 knots to keep pace with other French capital ships, with 170,000 shaft horsepower to propel her to this speed. Type No. 1 was the most realistic and achievable design, but it may not have been enough to counter the German H-class battleships, which were to be armed with 406mm guns. Type No. 2 was a direct step up from Type No. 1, designed to carry nine new 406mm guns in the same layout as Type No. 1. Displacing 42,500 tons, Type No.2 was four meters longer than Type No. 1, and required an additional 20,000 shaft horsepower to maintain the top speed of 31 knots, bringing her total horsepower up to 190,000. Type No. 2 would have carried the largest guns in the Marine Nationale, but this would have been a problem, as it would have introduced a fourth gun caliber to the fleet (alongside Richelieu’s 380mm, Dunkerque’s 330mm, and Bretagne’s 340mm), while the other powerful navies — bar the Royal Navy — only had two calibers. Furthermore, the 406mm gun’s own development program would have inevitably delayed the construction of these new battleships, and early estimates showed that Alsace would not be completed until 1946. Type No. 3 — the largest and most powerful study — was the largest complete ship study of the Marine Nationale. Displacing 45,000 tons, Type No. 3 reverted back to the 380mm guns, instead carrying twelve of them in three quadruple turrets, in the same turret design as the preceding Richelieus. Type No. 3’s AA suite was substantially improved, with the four additional 100mm DP dual gun turrets, and an increased number of 37mm AA guns. Type No. 3 was thirteen meters longer than the original Type No. 1 design, had a belt 20mm thicker, and was designed to be capable of outputting 220,000 shaft horsepower so the ship could reach 32 knots. While Type No. 3 had a wide range of benefits and outclassed almost all (known) current foreign battleships, the design was simply too large for the current French infrastructure and shipyards to handle. The Naval General Staff’s choice was relatively straightforward. Type No. 2’s 406mm guns would take too long to properly develop, and Type No. 3 was simply too large to construct as of the moment and would require lengthy and expensive government investment in the shipyards. Type No. 1 was chosen, as it was regarded as a well-balanced design which used mostly existing weaponry and could be built with relatively minor adjustments and improvements to the French shipyards and infrastructure. Two battleships of the Type No. 1 design were approved on the 1st of April 1940. The first, named Alsace, was to be laid down at the Penhoët No. 1 slipway following the launch of aircraft carrier Joffre in 1941. However, following the collapse of the French Army in June 1940, all capital ship construction plans were scrapped, and the two ships of the Alsace-class ultimately never made it to the shipyards. Various versions of the Alsace-class design projects in comparison with the Richelieu-class battleship. This page has been accessed 62,431 times.